The African Queen (1951), starring Katharine Hepburn and Humphrey Bogart is the only classic movie Netflix Instant added in November. Here's what you need to know about The African Queen (1943), which is the only pre-1970 film added to Netflix Instant in November 2016. The Stars: Katharine Hepburn, Humphrey Bogart, and Robert Morley. Source Material: A 1935 novel by C.S. Forester. Awards: Bogart won the Academy Award for best actor. Hepburn was nominated for best actress, Huston for best director, and Huston and James Agee were nominated for best adapted screenplay. This movie also made it on to several of the American Film Institute's best of lists, including ranking No. 17 on the 100 years, 100 movies list. Plot: At the beginning of World War I, English missionaries to East Africa Samuel (Morley) and Rose Sayer (Hepburn) have the village they live in destroyed by German soldiers. 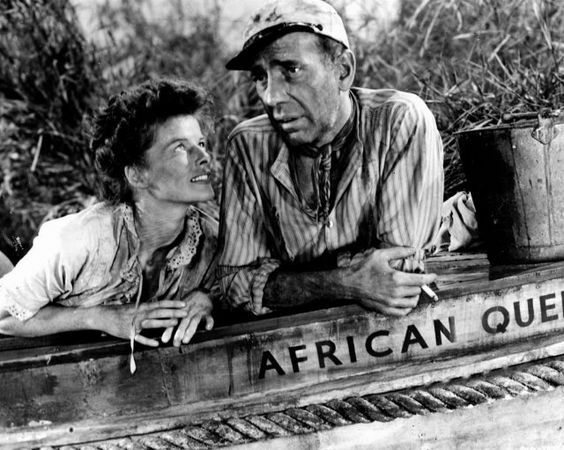 Samuel eventually dies and Rose reluctantly leaves the village on a rundown boat, The African Queen, whose skipper is a rough around the edges Canadian Charlie Allnut (Bogart). Charlie wants to sit out the war hiding on the river, but Rose persuades Charlie to embark on a daring scheme to torpedo a large German gunboat. Backstory: The rights to Forester's novel had been floating around Hollywood for the better part of a decade before producer Sam Spiegel and writer/director John Huston finally got enough financing to make a movie on location in Africa. 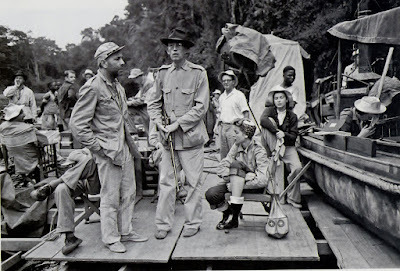 The cast and crew, including Bogart's wife, Lauren Bacall, headed to Uganda and the Democratic Republic of Congo for several arduous weeks of location shooting. The result was a massive hit that earned Bogart his only Oscar. 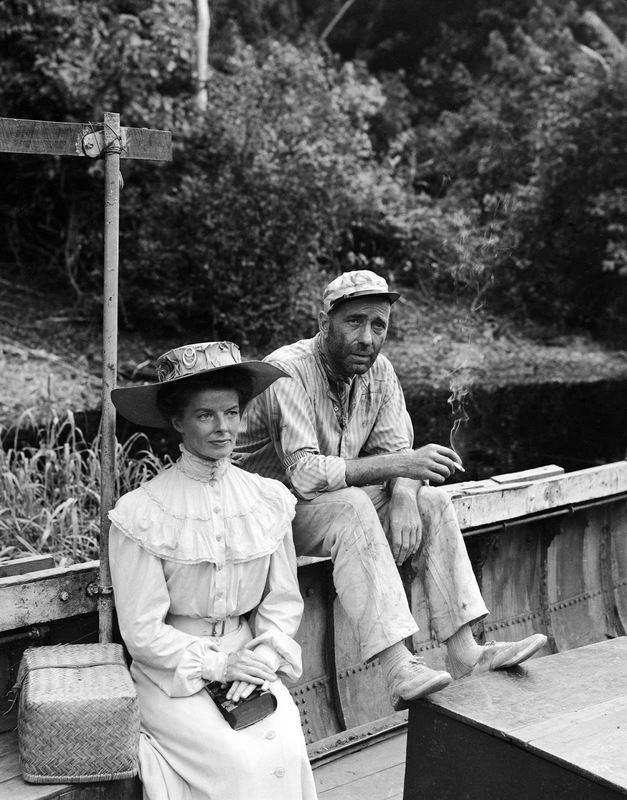 Katharine Hepburn and Humphrey Bogart on the set of The African Queen (1951). Best Performance: While Robert Morley gives his usual sensitive performance as Rose's idealistic brother, the only two actors that matter in The African Queen are Bogart and Hepburn. Bogart is both very funny and very touching as the gin-soaked Charlie, but, it is Hepburn, who was instructed to play the role like Eleanor Roosevelt by Huston, who gives the performance of the film. Hepburn's Rose evolves from a pious missionary to determined freedom fighter to tender woman in love in what is perhaps Hepburn's greatest screen role. Best Scene: Charlie and Rose awkwardly declare their love after making it through dangerous rapids. Humphrey Bogart, director John Huston, and Lauren Bacall (seated) on the set of The African Queen (1951). Best Line: "Nature, Mr. Allnut, is what we are put in the world to rise above," Rose chiding Charlie for drinking gin. Fun Fact: The boat used in The African Queen is now a tourist attraction in Key Largo, Fla. The Critics: The African Queen has an 100 percent fresh audience rating on Rotten Tomatoes and Leonard Maltin gives it four stars in his Classic Movie Guide. 1. African locales. The cast and crew faced several challenges during the filming, but, other than illness, none was more daunting than trying to lug the cumbersome Technicolor cameras around the jungle. However, the gorgeous footage that resulted was well worth the sacrifice. 2. Middle-aged romance. 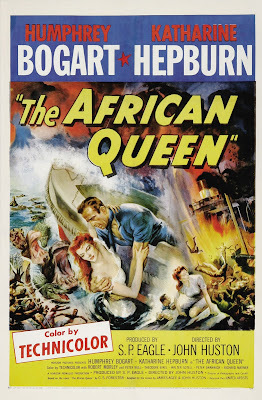 One of the reasons none of the major studios ever produced The African Queen was because they thought that audiences would be turned off by a romance between two middle-aged people. Obviously, that wasn't the case, and Hepburn and Bogart's quirky chemistry makes them one of old Hollywood's most endearing onscreen couples. 3.Robert Morley. While The African Queen is a tour de force for both Bogart and Hepburn, Morley, an underrated actor who gave fine performances in everything from the costume drama Marie Antoinette (1938) to the Miss Marple mystery Murder at the Gallop (1963), quietly makes an impression as Rose's idealistic brother. Availability: If you don't have Netflix Instant, The African Queen is available on DVD, Blu-ray, and video on demand.